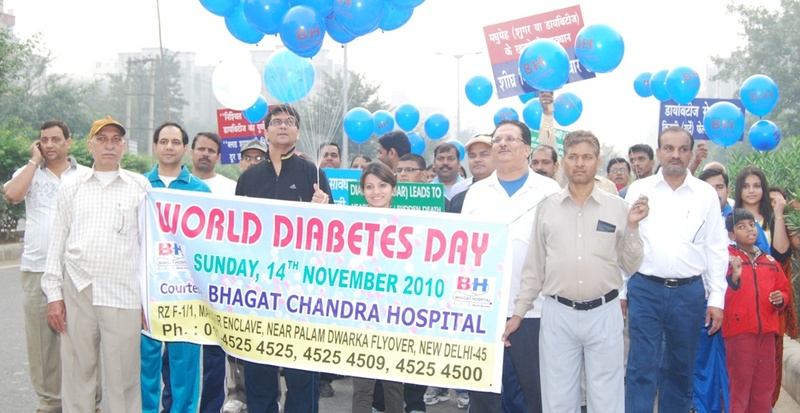 A health walk was organized by Bhagat Chandra Hospital to mark World Diabetes Day. On this occasion the people were made aware about the effect of diabetes and its serious consequences. Diabetes can leads to Heart attacks, sudden death, Paralysis, Kidney failure, Blindness, Impotence etc. Around 100 people were gathered and the walk of 3 kms was held from Mahavir Enclave to Dwarka Sports Complex and back. The participants were carrying the slogan and got their sugar checked. Dr. Kamal Parwal gave a lecture on diabetes.